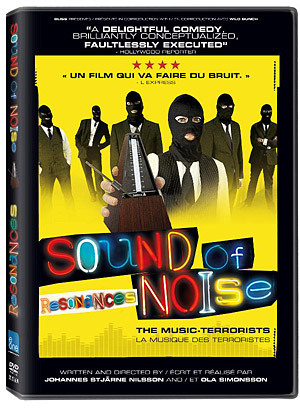 eOne released Sound of Noise on DVD in Canada on June 26, 2012. Help support Toronto Screen Shots by buying it on Amazon.ca. Sound of Noise (Directors: Ola Simonsson and Johannes Stjärne Nilsson): With a name like his, you’d think that Amadeus Warnebring would love music. But you’d be so so wrong. The police detective is in fact completely tone-deaf, despite being the son and grandson of musical geniuses. Even his younger brother is a famous conductor now, while Amadeus does his best to avoid family functions where musical performances are practically compulsory. Things are going along just fine until the day he’s called to an accident scene where officers hear an ominous ticking. 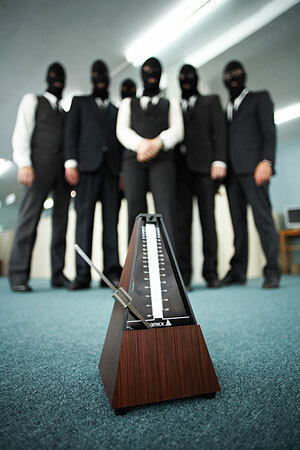 While they are prepared to call the bomb squad, Amadeus recognizes the presence of a metronome. While the bomb threat evaporates, he’s drawn into something just as dangerous, at least for someone who hates music as much as he does. Across town, we meet a band (yes, literally a band) of musical “terrorists,” six drummers who plot to unleash their quite literally titled composition “Music for One City and Six Drummers” which is introduced in a clever animated segment. Its four movements make up the set pieces of the film, and we shift perspective back and forth. Our sympathies alternate between the detective who just wants some silence and the anarchic and beat-loving musicians. At this point you’re probably thinking that Sound of Noise doesn’t, er, sound like any film you may have seen before, and you’d be right. This droll comedy from Sweden is one of the most unique and playful films I’ve seen in a long time, which is why it’s a shame that it never received a theatrical release here in Canada. The whole film bursts with rhythm, particularly in the excellent set pieces (which take place at a hospital, a bank, an opera house, and in a hydro field full of high-voltage wires) and it needs to be experienced with a good sound system. Sound of Noise has elements of a heist movie, and even a bit of romance, but at its heart it’s a piece of performance art. The reasons behind the musicians’ plot are mysterious and irrelevant. Just enjoy the audacity (and absurdity) of their performances. At the same time, it’s easy to see why a distributor would have a hard time marketing a film like this one. But if you like music, and deadpan Scandinavian humour, and just the idea of people using non-musical objects (including an anesthetized hospital patient) to make music, you’re going to love this. P.S. If you’re a short film lover like I am, you’ll be interested to know that Sound of Noise was based on the short film Music for One Apartment and Six Drummers (2001) by the same directing team and even the same cast. I’ve embedded it below the trailer. This entry was posted in DVD and tagged music, sweden. Bookmark the permalink.